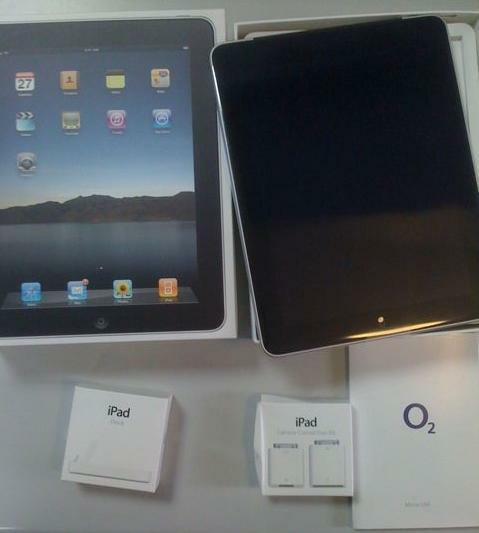 My iPad arrived at work at approx 12:15 on 27th May 2010 (a day early). No queuing for me, it's here. What a week, first the Pandora, then this. Only got iPhone camera with me, so apologies for the picture quality. My Open Pandora Handheld arrived - Was it worth the wait? 30th September 2008 was an expensive day for me. The iPhone 3G (which had been available on contract since July in the UK) was released as a Pay As you go phone for £399 for the 16gb model. I bought this in the morning before work and then spent the rest of the day refreshing my internet connection waiting for the Open Pandora pre-orders to start. As soon as they did, I put in my order - another £207 gone. I had been eagerly awaiting the Open Pandora console since it was announced a number of months earlier. 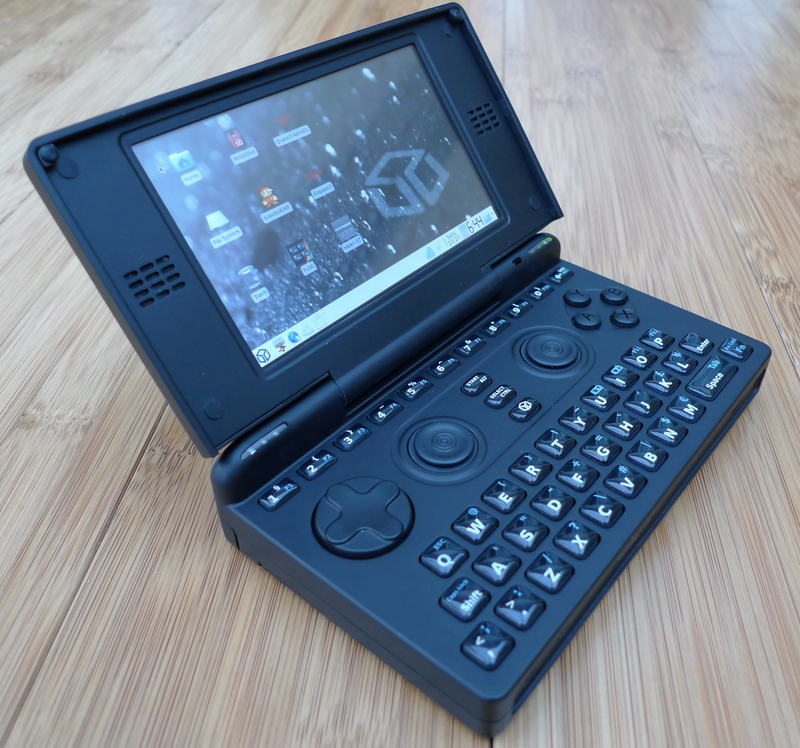 At that time the main interest for me was a cheap web-capable mini netbook with good retro game capabilities. I also planned to use it as a video player to attach to a Pico projector for viewing films when travelling. The anticipated ship date was November 2008 - so this was to be my Christmas 2008 gift to myself. It was a surprisingly different computer landscape back then - notebooks were the big thing - the 900 Asus eeepc had just come out. The iPhone app store had only just launched and although it showed early promise - no one knew what a game changer it was to become. The Open Pandora got delayed due to countless problems with suppliers etc - and the ship date slipped and slipped. On a number of occasions I contemplated cancelling my order - but the fear of losing my place in the queue for something so unique (and due any month) made me wait it out. As the months moved on my iPhone became more and more essential as each app made incremental improvements to its functionality. The idea of using the Pandora with a USB 3G dongle to view the internet began to seem old fashioned especially when the iPhone did it so well. Websites started to have iPhone friendly versions or apps like Wikipedia or Ebay put the online content inside a smart wrapper. 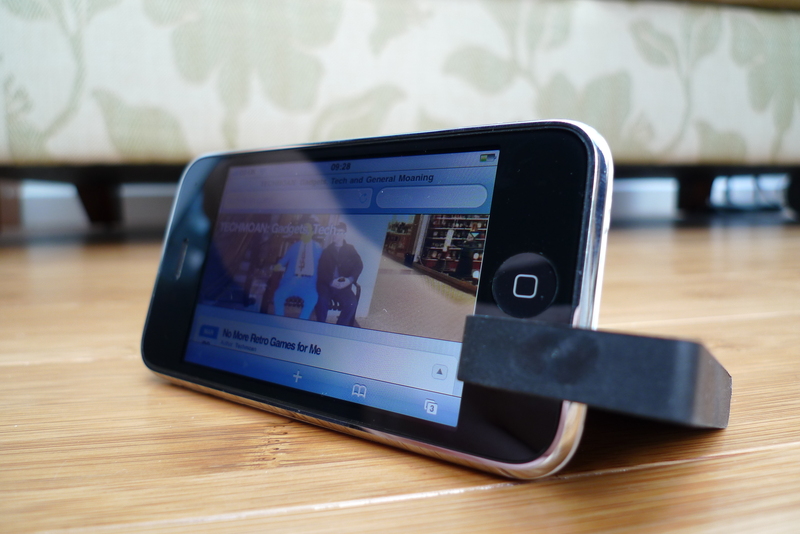 Playing my xvids became a lot easier on the iphone due to the appearance of simple video conversion programs. But I didn't need to convert downloaded TV shows to entertain myself any more as my daily train commute started to consist of watching video podcasts. These have exploded in abundance, subject matter diversity and quality over the last couple of years. In addition the iPhone made me drop my old habit of playing DS games. The iPhone games got better and better whilst simultaneously getting cheaper and the DS got put in a drawer. So all the main reasons for me buying a Pandora got stripped away, one by one. The retro-games, the internet, the video. So why did I hold on and wait it out, I don't really know why. I still like the idea of a PC (of sorts) in my pocket. In a couple of days I'm visiting a family member to sort out their wifi router settings and the Pandora will be totally adequate to do this job (no need to take the laptop). When I next go on holiday, I will use it to backup my video camera's memory cards to an external hard drive. I'm sure many more unexpected uses will crop up too - but there is one experience that has made me understand why products like this must succeed….. When it first arrived, I turned it on and it started to boot, it seemed to be taking too long, so I restarted it. I found out later that this was the wrong thing to do - the first few units needed to have an initial 10 minute boot to install the o/s - I'd interrupted this feature and I'd now messed up my install and it wouldn't boot up at all. I posted my problem to the openpandora forums late in the evening- within a few minutes a couple of people suggested that I needed to reflash the firmware. Where could I get this firmware? I replied - then I got an answer from one of the creators of the Open Pandora - 'EvilDragon'- he explained how to do the flash (a simple procedure for the 'unbrickable' Pandora) and advised they were uploading the firmware. Sure enough in a few minutes 'Notaz' (another of Pandora's founding fathers) uploaded the firmware to the thread and a few minutes after that I had a fully functioning device. So that's why the Pandora needs to be a success. The people who made it really do care about it. They may have had some setbacks along the way but there is a big community of people who wanted an open standard games machine and they have finally got their wish. It's very easy to be critical of things - but sometimes you come across people who really need and deserve your support. Now I can't programme code or design games (I'm very much the end-user in this relationship). However I 've tried to support this project in my own small way, firstly by waiting in the queue, rather than dropping out, and secondly by making a video to spread the word. So here is the worlds first HD youtube video of the Open Pandora (probably). It's rather rushed - but I just wanted to get something out there asap, enjoy. I've put together another video review for a spy camera - the big difference this time is that the camera records in HD (1280x960 30 fps). I imagine that this will be the same camera unit that is fitted inside the HD Spy watch - so the review might help if you are interested in that device too. I'm pretty happy with the way the review turned out - the pen itself, well that's another story, but you'll need to watch the video for a full explanation. Let's just say that not all HD is really HD. Today I received the Version 2 JJC ALC-3 Lens Cap from an Ebay seller in HK. JJC produced the version 2 lens cap in response to users comments about their original LX3 auto lens cap vignetting at maximum zoom (the doors were visible in the corner of the picture). To combat this, JJC added raised plastic ridges inside their spring loaded doors in an attempt to keep the doors wider apart to prevent them from encroaching on the lens. The packaging for the version 1 and 2 lens caps are identical - the only difference I noticed is a variation in the font on the label that states "Panasonic DMC-LX-3". The v2 lens is supplied with a single small thin piece of 3m sticky back rubber (there are no instructions in the pack to explain what this is for). The springs on the doors seem a bit stronger that the v1 - which was another common complaint . Anyway - the big question, do the v2 lens cap improvements prevent vignetting? Answer....No. Even though the v2 modification does keep the spring loaded doors further apart, the vignetting is still very evident when a photo is taken of a white wall. My suggestion is still to do the 5 min modification I demonstrated in my video. I've already done this to my v2 cap and it works perfectly. This is the keyboard that has finally made me abandon my hunt for the perfect Media Centre remote (for the time being). It's not a perfect device - but it's good enough, however there is still plenty of room for improvement. I bought it from USB.BRANDO.COM - they ship worldwide from HK for only $3! So the total cost (given exchange rates at the time of writing) is £43. It arrived on my desk at work the day after the volcanic dust cloud shut down any further UK airfreight - so I was very fortunate to get it when I did. Lenovo have an unexpected hit on their hands with this device- it's been listed in their catalogue since December 2009 , but no one really noticed it in the accessories section and Lenovo didn't advertise it either. 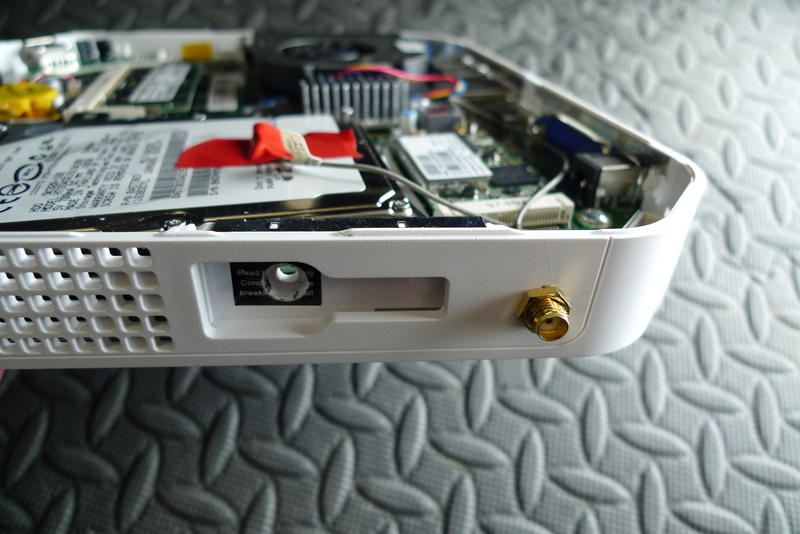 It was only when a couple of tech blogs spotted it that the device became a hot commodity among HTPC users. After many false starts, the Media Centre or Home Theatre PC has arrived. Boxee and XBMC together with streaming video services paired with cheap low power PCs equipped with TV friendly HDMI sockets, wireless N and packing sufficient power to play back HD video, have led to an explosion in the numbers of PCs attached to TVs. The one missing link has been a suitable remote to control these devices from an armchair where a traditional keyboard and mouse just don't belong. 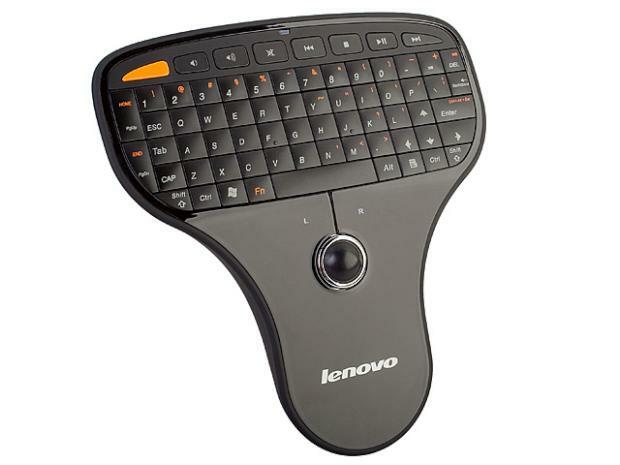 A media centre remote needs to have a keyboard for internet browsing, a analog pointing device for application selection (mouse, trackpad etc) and be small enough to hold in one hand. The Logitech Dinovo Mini was the first such device on the block and seemed ideal - but was plagued by reliability issues and is still prohibitively expensive. The Lenovo N5901 (previously know by its part number of 57Y6336) is the first serious rival to the Logitech (at half the price) - watch the video to see how it fares. Simple, obvious and cheap enough for me not to feel annoyed for not inventing it myself. 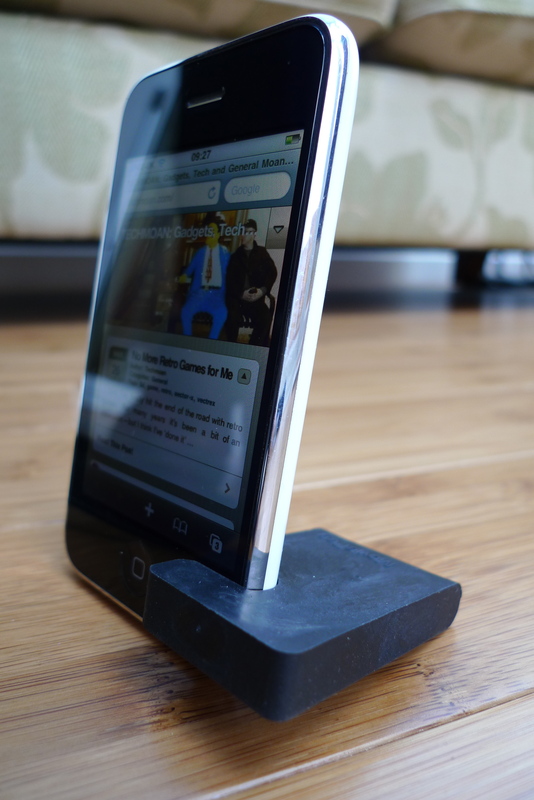 The best iPhone stand I've tried - recommended. 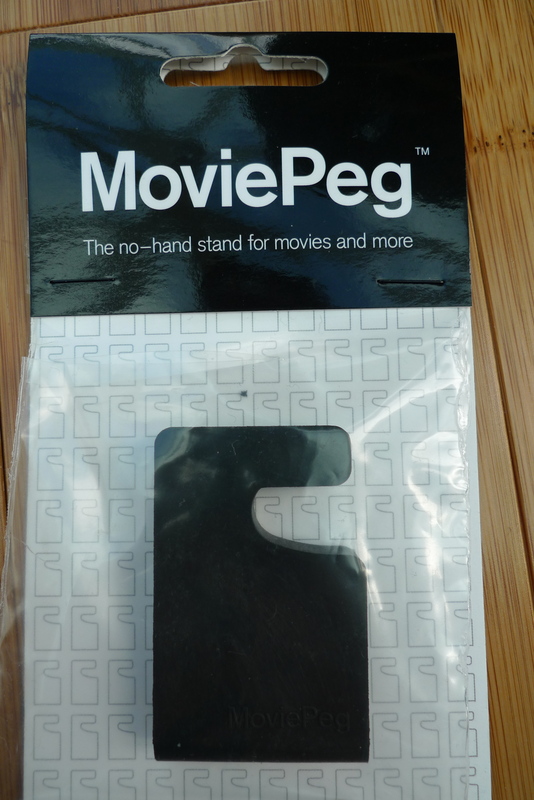 Available from here - Movie-Peg.com (surprisingly it's a UK company). I've found it impossible to mount my DV80 camera to my motorcycle helmet - so I bought a keyring spy camera (or two) to replace it - but I've found that the improved ease of mounting comes with a number of trade offs. The camera cost me £10 delivered to the UK from a Ebay HK seller. I think I've finally hit the end of the road with retro games. For many years it's been a bit of an obsession - but I think I've 'done it' now and it's time to move on. My moment of clarity/realisation came after catching site of myself playing the new 3D Sector-X game on my Vectrex (video below). 2010's A-list games stand head and shoulders above anything from the 1980s and I even find that the majority of my iPhone games are better than any Spectrum or Atari ST game I ever owned (and for a lower price than a budget game of 20 years ago). I'm seriously contemplating cancelling my order for an Open Pandora because I'm not sure I'll get enough use out of it playing old roms when there are so many new games demanding my attention. I first became aware of Nixie Tubes in 2002. 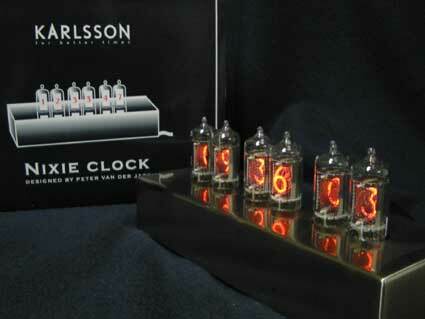 I've always had an interest in unusual watches and clocks and so when I saw the Karlsson Nixie Clock, a clock that appeared to display it's time using glass valves, I was intrigued. After reading up on Nixie Tubes and discovering the vast network of Nixie Clock designers I decided that I needed one of my own. A number of kits were available at the time - but these involved soldering hundreds of components onto pre-printed circuit boards, something that I didn't feel confident doing. My search for a Nixie clock eventually lead me to a ready made clock, made by a company in the Netherlands. This was my first clock - it uses IN-14 tubes. It has been on display in my lounge for 6 or 7 years now and has worked flawlessly. The display is perfectly viewable from way across the room and yet doesn't catch the eye or disrupt the my TV or Projector viewing, even in a totally blacked out room. I think this has something to do with it's soft orange glow or the fact the digits are organic shapes rather than angular digits. It keeps good time and has a nice standby schedule feature Mine goes dark 11pm-6am to save the tubes. It was a good first clock, - but I wanted more. Is it a 2 or a 5 ? I preferred the look of the Nixie clocks that displayed all the circuit boards and the entire body of the tubes, rather than hiding them away inside a case. Also my tubes utilise a flipped '2' to form the '5' - something that probably saved a few Kopeks when the tubes were originally manufactured in Russia in the 1970s - but which looks a little bit odd. 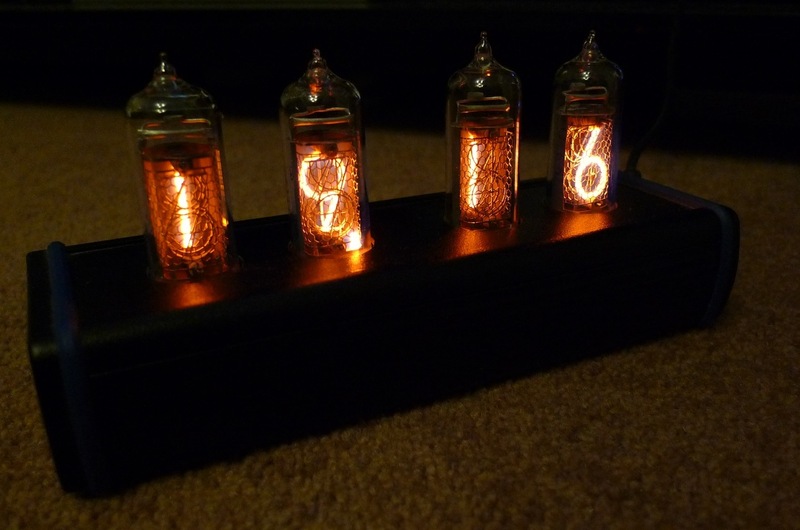 I decided that my next clock should use the Rolls Royce of Nixie tubes - the IN-18. The IN-18 tube was one of the largest tubes made and was probably used in installations that needed to be read from a considerable distance - like a railway station departure board. The digits in an IN-18 tube are 40mm tall - the digits in my IN-14 clock are just 18mm. My main obstacle was that IN-18 clocks were just much too expensive. After months of searching - I found a Hong Kong company on Ebay who sold an pre-assembled but unpopulated IN-18 socketed circuit board and case. I then eventually found another seller in Kazakstan selling NOS (new old stock) IN18 tubes - presumably appropriated from an abandoned Russian facility. All together the components for the clock cost a couple of hundred pounds. Oddly enough - when assembled, I found the large digits and the continually changing seconds to be too distracting in the lounge and it was relegated to another room in the house. 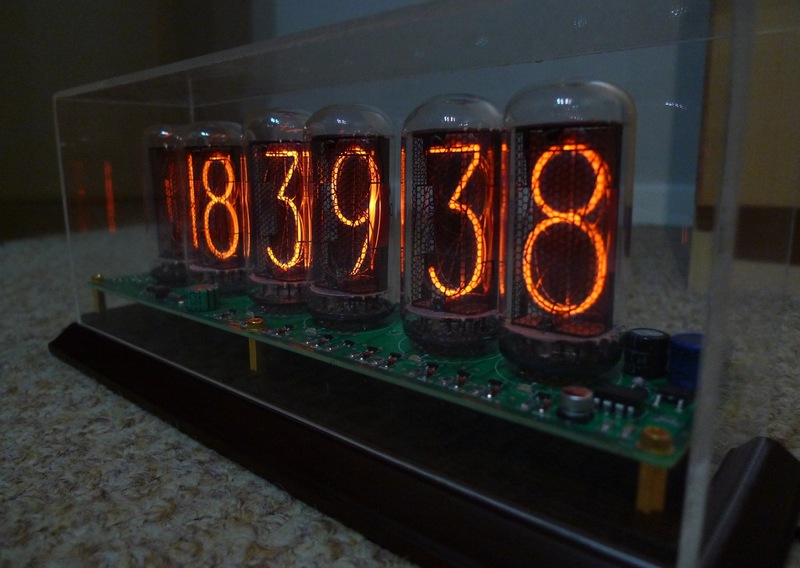 So bear this in mind if you are buying a Nixie clock - sometimes bigger and more elaborate isn't necessarily better. 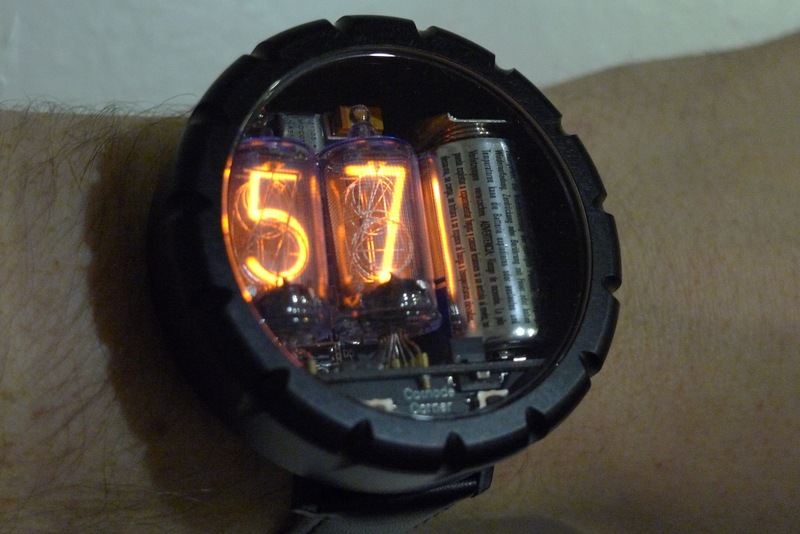 Throughout all this Nixie hunting and research, I became aware of David Forbes at Cathode corner's attempts to make a Nixie watch. I couldn't afford one at the time - but kept checking in on his site from time to time. The initial small batch sold out and David's site went quiet - with no new updates or news, it seemed like the era of the Nixie watch had been and gone. 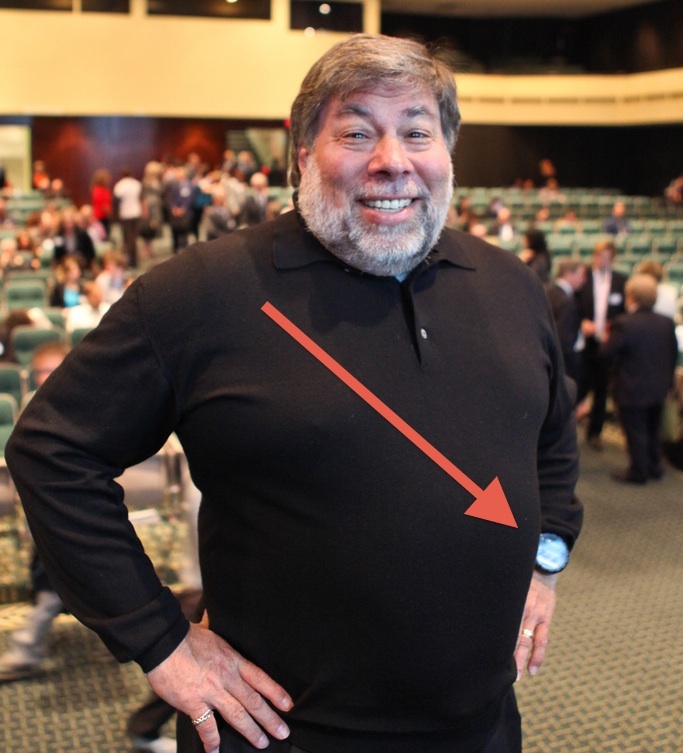 Then in October 2008 I read an BBC Interview with Steve Wozniak - where he said that the one gadget he wished he had invented was the Nixie Watch that he proudly sported on his wrist. I emailed a link to the article to David and to my surprise he was kind enough to respond and thank me for making him aware of the article and said that he felt honoured by Woz's comments . A few months later, David updated his site to say that he was working on producing an updated version of the watch (possibly buoyed by Woz's comments) - and then about a month ago he relaunched the site and invited orders for the watch. This time around I didn't hesitate and immediately ordered one for myself. After getting held up in UK customs for about a week - a delay for which I was charged £53 - I eventually got my watch. So as usual, I've put together a video which you can see below - or click through for the HD stream. The watch isn't cheap - but it's also not overpriced, given the exclusivity and the hard work that has gone into it's development and production. In reality, it probably costs more for David to make one of these watches than it does for Rolex to churn out another one of theirs. It's also good to know that all the money you pay is going directly to the inventor designer and manufacturer of this unique wristwatch. I've hacked together a cheap and easy fix for the poor quality signal received by my internal WiFi card on my Revo 3610. As usual a video says a thousand words - but the picture above will have prematurely given the whole game away if you know anything about what sockets do and don't belong on a Revo. Edit - (Update)... I thought I should mention that the reason I am sticking with the internal card rather than just using a USB WiFi dongle is because my internal mini PCie card works on the 5Ghz band and I can't find a 5Ghz dongle. 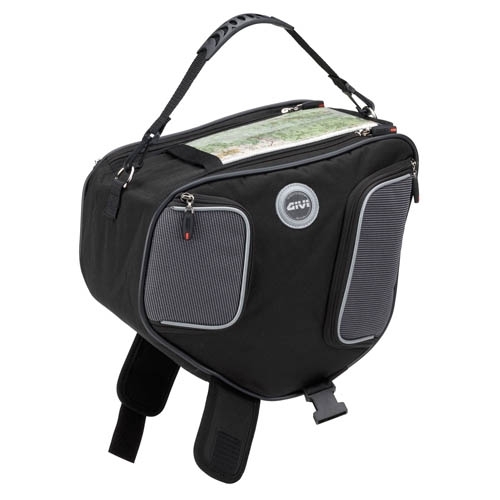 I've put together a video to demonstrate the Givi T455 Scooter Tunnel Bag. My reasons for buying this were a bit unusual - the video explains this in more detail, but to give you a bit more of an understanding into my scooter inferiority complex, I'll elaborate a bit on the bike vs scooter issue. If you ride a scooter and you live in the UK or the US you will have no doubt suffered from an anti-scooter prejudice that exists amongst many people (including 'proper' motorcycle riders). "Do you ride a motorcycle - what kind is it"? "Oh it's just a scooter - I suppose you are allowed to drive that on your car licence, are you saving up for a real motorbike?". Anyway enough ranting about scooters vs motorbikes. I like both, but find a scooter more convenient for my needs. The Givi T455 makes my scooter even more convenient as far as storage goes - but less convenient because it's one more thing to carry around when I get off the bike. It also might not appeal because of the permanent velcro pads that need to be attached to the bike and it's pretty expensive (at around £60). The reason I made a video is so that people can see what it looks like in situ and how it fits on the bike - two things that I wasn't able to find enough information about about when I bought mine. I just realised that in the video that I might be pronouncing Givi incorrectly - by saying 'give -e' when it's probably more like 'jhivi' as in Givenchy, anyway tomayto tomarto, I don't suppose it really matters. I know that this is something that only a handful of people are interested in - but that's fine by me - thanks for looking in, and if you don't care about scooters or scooter luggage then that's fine too - it's all good.